Your first 3 minutes are FREE talking live with me. 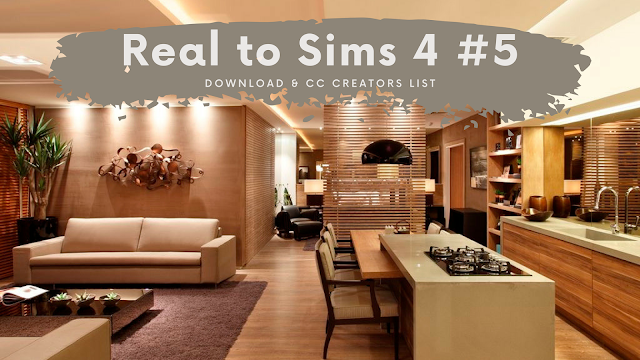 Read More :- "MASTER PSYCHIC READER~ ACCURATE & AMUSING"
Read More :- "REAL TO SIMS 4 #5 + DOWNLOAD + TOUR + CC CREATORS | The Sims 4"
After the devastating loss of Rascal, I went back to training out on Route 2 with Lucky. There was no way a mere Metapod was going to stand up to Gym Leader Brock. I had confidence that Rascal, Nibbles and Kiwi would help me earn the Boulder Badge, but without Rascal my confidence faltered. It took us a few days, but eventually Lucky sprouted wings and evolved into Butterfree, a significant improvement over the lovably little lump of a Pokémon he was as Metapod. I did not neglect Kiwi and Nibbles during this time, either, but their progress was a bit less important. Once Lucky had evolved, I spent what little money I had on a couple of potions at the PokéMart. Although they were expensive, I would not let another Pokémon fall in the Pewter City Gym. I absolutely would not. My nerves were shot as I stepped into the gym for the second time. I remember I was sweating and shaking just thinking about facing Brock. I saw the Junior Trainer who had bested my poor Rascal. He gave me an approving nod, but it did little to improve my disposition. Brock stood at the far end of the gym and beckoned me forward. He had seen my fight with the Junior Trainer several days ago and was eager to face me. I clenched my jaw tightly as I threw out my first Pokémon. Kiwi met Brock's Geodude face-to-face in the gym's arena. We wasted no time kicking up as much dust as possible to obscure Geodude's vision. Brock had Geodude spend most of its time curling up into a defensive ball, but every now and then it lashed out with a tackle that it simply couldn't land on Kiwi. When I felt it's accuracy was sufficiently incapacitated, I withdrew Kiwi and used Nibble to wear down the Geodude slowly but surely. The Geodude was powerless in the dust Kiwi's sand-attack had kicked up and against Nibbles relentless tackling. Then Brock threw out his champion, the Onix. I tossed Kiwi back into the ring hoping to repeat our earlier performance on Geodude. Kiwi kicked up as much sand as he could, but Onix still managed to land a lucky strike on him. It hurt Kiwi enough to discourage me from keeping Kiwi on the field any longer. Nibbles was sent out while Onix merely bided his time. I knew immediately that any attacks on Onix while in this defensive state would be unleashed twofold onto its attacker. Your only choices are to crush it swiftly, which is difficult against a rock hard Pokémon like Onix, or to wait it out. Nibbles began to stare down his opponent while it remained in its defensive posture. 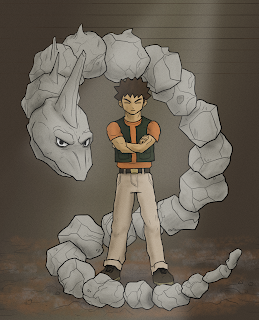 Slowly this would lower the Onix's defenses and leave it vulnerable to a massive strike. Eventually, Nibbles was exchanged for Lucky who covered the Onix in its string shot while it continued to wait for our attacks. Feeling safer, Kiwi returned to the battle to continue whipping up sand into Onix's face. Then as soon as Onix released its defensive posturing, Kiwi slammed it with a gust from his wings and knocked the Onix to the floor. That was how I won my first badge in the great region of Kanto. Brock was impressed and clasped me firmly on the back with a great slap of his hand. He knew about Rascal, of course, and was pleased at my stance on training. He liked how patient and defensive I was and as a reward not only gave me a handsome sum of PokéDollars, but a Technical Machine that would teach certain eligible Pokémon his Onix's signature technique of biding time and waiting for the counter strike. This strategy didn't really work out well for Brock that day, so I wasn't sure how I would incorporate it on to a team that I intended to take as few hits as possible. I didn't want to be rude, though, so I graciously accepted the TM #34 and the Boulder Badge. I was now officially on the road to challenge the Indigo Plateau League. 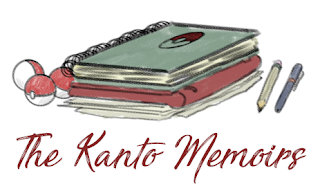 I really hadn't come to Kanto expecting to do something quite that dramatic, but I was slowly being pushed in that direction. Professor Oak had prompted me to take this journey and running into Wolf made me question what the journey really meant to me personally. The encounter with the snarky trainer in Viridian City helped me shape my personal goals and encouraged me to challenge the gyms to seek reputation and understanding in the world of Pokémon training. Now, I had my first badge pinned proudly to my backpack and I was on my way to the next adventure — with considerably more money to spend thanks to my winnings. Read More :- "Battle For Boulder Badge"
Grow uP eSports athletes and staff will wear Adidas, one of the world's leading sportswear manufacturer, until 2021. The two-year deal includes the supply of Adidas gaming jerseys, tracksuits, training jackets, t-shirts and hoodies. "We are proud to work with renowned global brands like Adidas to further consolidate our brand and to develop and increase the credibility of Esports in the modern society", says Telmo Silva, Grow uP eSports CEO. 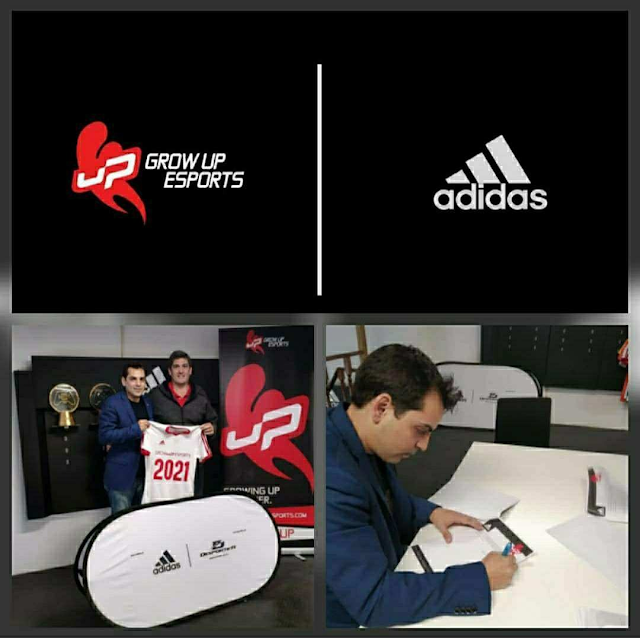 Grow uP eSports team's currently compete in FIFA, Pro Evolution Soccer, League of Legends, Counter-Strike: Global Offensive and Street Fighter V.
Read More :- "GROW UP ESPORTS Wears ADIDAS"
Short.pe: Short.pe is one of the most trusted sites from our top 30 highest paying URL shorteners.It pays on time.intrusting thing is that same visitor can click on your shorten link multiple times.You can earn by sign up and shorten your long URL.You just have to paste that URL to somewhere. Wi.cr: Wi.cr is also one of the 30 highest paying URL sites.You can earn through shortening links.When someone will click on your link.You will be paid.They offer $7 for 1000 views.Minimum payout is $5. Cut-win: Cut-win is a new URL shortener website.It is paying at the time and you can trust it.You just have to sign up for an account and then you can shorten your URL and put that URL anywhere.You can paste it into your site, blog or even social media networking sites.It pays high CPM rate. 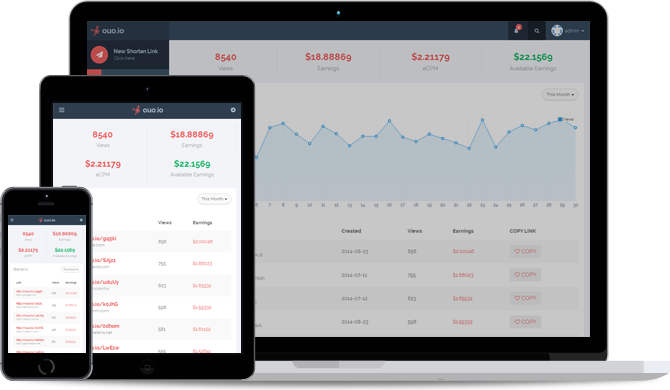 BIT-URL: It is a new URL shortener website.Its CPM rate is good.You can sign up for free and shorten your URL and that shortener URL can be paste on your websites, blogs or social media networking sites.bit-url.com pays $8.10 for 1000 views. Read More :- "11 Highest Paying URL Shortener: Best URL Shortener to Earn Money"
Slowdown is certainly a relic of our past when video games used to push their processors to their limit and beyond. 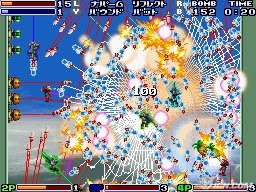 When there were simply too many explosions and bullets streaking across the screen the frame rate dropped and the game began to play is slow motion. Many would like to believe that we are now currently in an age that has moved beyond slow down. Though the frame rate in our modern releases may hiccup (GTA4), sputter (MGS4), or even drop to a cinematic 24 frames per second (Shadow of the Colossus), all of these performance slips are far better than back in the day when the games used to slow to a crawl. With the advent of widespread online gaming, many gamers now find it strange when latency issues are resolved by slowing down or even temporarily pausing the action for all players until the information flow can be reestablished. My recent exploration of Bangai-O Spirits for the Nintendo DS has caused me to think about the possible design benefits of slowdown. Unlike bullet time, where the game time is slowed usually by the player to enhance reaction time and accuracy, slowdown happens as a result of an excess of onscreen elements that require graphics and collision processing. 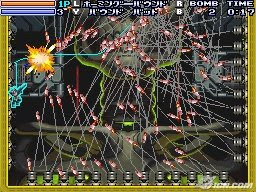 In Bangai-O's case, when the player launches a counter attack of 100 homing missiles, the game automatically slows down. The benefits for the slower gameplay are the same as with bullet time. When the game is slowed down, the player has additional time to process and analyze the game. But unlike bullet time, the amount of slowdown that occurs is directly proportional to the amount of in game "chaos" on screen. Like the smart slow-mo from Perfect Dark that activates when two players in a multiplayer match move within a certain proximity of each other, slowdown makes the game time relative to action and position. It's like Where's Waldo, but different. Slowdown might have addition design benefits that may not be as obvious to discern. As it turns out, Bangi-O Spirts features 4 player simultaneous gameplay. Designing a system that can communicate hundreds of packets of data between two systems can be extremely tricky even for two consoles using high speed connections. Geometry Wars is a perfect example of a game is so smooth with so many individual items on the screen each with their own behaviors and patterns that react off of the player's position and attacks as well as other elements in the level, that trying to get the game to work online would invariably slow down the game speed. In other words, because there's simply so much chaos in Geometry Wars the Geometry Wars that we know and love would be impossible to make work online with our current technology. So what about Bangai-O Spirits for the DS? One might initially think that the the DS processors and wifi connections aren't better suited than an Xbox360 for the task for communicating the chaos of battle in a multiplayer mode. But slowdown, once again, plays a very key role in Bangai-O's case. The player should already be used to the contextually fluctuating game speed in the single player mode. So if the game slows down just a bit more to maintain communication with 3 other DSs, the player probably wouldn't notice. Because slowdown is an integrated part of the normal gameplay, using it as a sort of shield/buffer for multiplayer wireless communications is quite genius. Bangai-O Spirits is a rare case indeed. Not only does it get away with massive slowdown that can drop as low as 1 frame per second, but in many ways the slow down works better for the gamepaly and multiplayer. In the moments when everything slows down, I have an opportunity to analyze the battle field, look at the map, check enemy health or any of the other stats before thinks kick back up in speed again. And for a game that accurately captures anime action in a video game, I'll take all the help I can get. As modern games continue to push the technical limits of video games while maintaining relatively smooth gameplay and high frame rates, it's interesting to see that slowdown, which many consider to be a technical flaw, can be successfully embraced and incorporated into the core design of a game. Stay tuned for my explosive review of Bangai-O Spirits. And if you're worried about the future of slowdown and/or the potential in relative game speed and design, then look no further than Drebin #1 Asynchronous Time. Read More :- "The Genius Of Slowdown"
This set of Vampire Counts counters replaces the set that I did well over a decade ago while I was active on the Warmaster Yahoo email list. Unlike the old set, which was slightly undersized, this set will print to the full 20mm x 40mm counters. 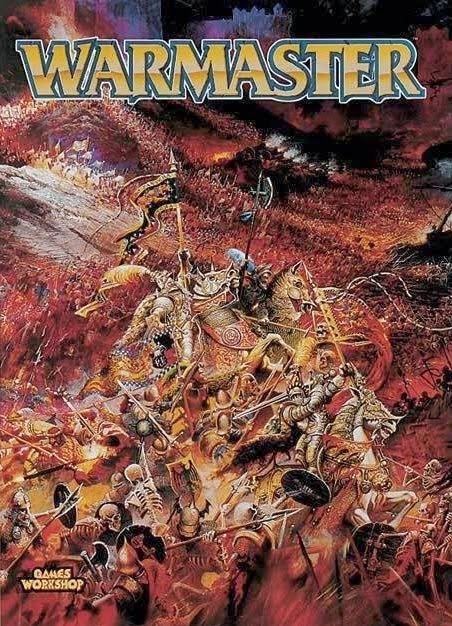 As well as knew images, I've also included Archer units, which are not in WM but are in many other games, such as HOTT. I hope some of you find these counter sets useful.You can print these at office printing places, like Staples, using heavy card stock paper printed at actual size. You can also print on regular paper and then glue the counters to wooden bases. (Check the older posts on how I did this with my Empire army.) Currently, I'm printing the counter sets at Staples using regular paper, spray gluing the back of each sheet with Super77, attaching each sheet to an old comic book backing board, and then cutting out the counters using a sharp Xacto knife with steel ruler. Using the backing boards makes for cheap, sturdy counters. 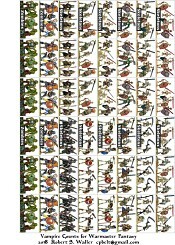 Click on the counter set image above to download the complete army counter set in PDF format. 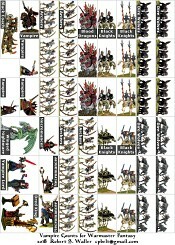 The set has enough counters to create many armies of 2000 points or less. Of course, if you need more counters simply print more copies! 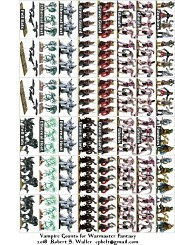 Read More :- "Warmaster Fantasy - Vampire Counts Counter Set Revised"